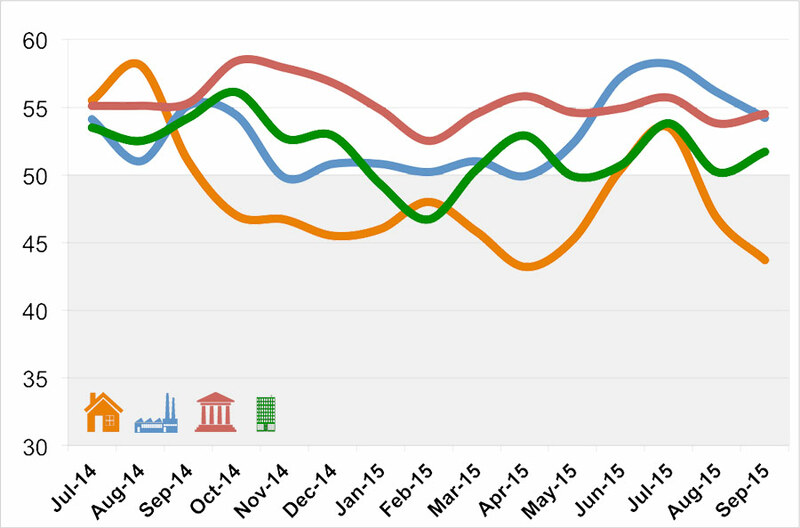 It may be getting colder outside, but the Architecture Billing Index (ABI) is heating up. In September, the ABI bounced back to positive territory, and has seen growth in two-thirds of the months this year. The AIA reported that the September ABI was 53.7, up 4.6 points from August. Any score above 50 marks an increase in billings. BILLINGS BY REGION: NORTHEAST (ORANGE), MIDWEST (BLUE), SOUTH (RED), WEST (GREEN). 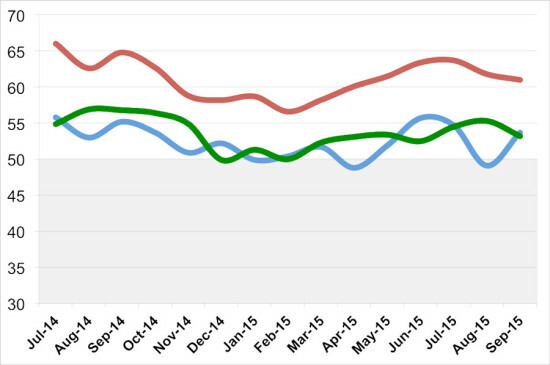 To that end, the new projects inquiry was down to 61.0, a decrease of 0.8 points from August. 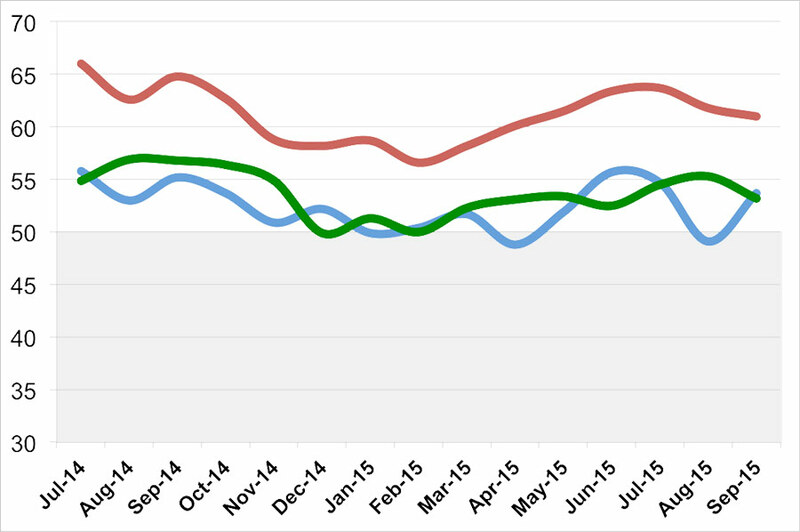 The design contracts index was at 53.2, a drop of 2.1 points from August. The South (54.5) led the Midwest (54.2) by a hair for regional averages. 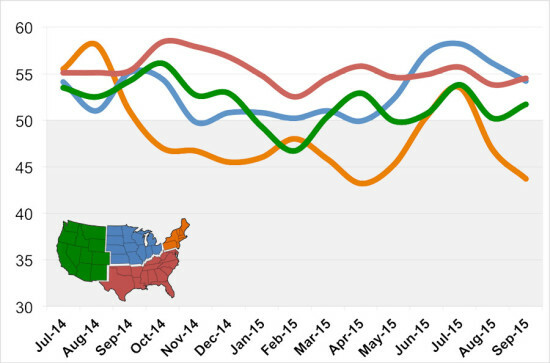 The West, at 51.7, was up 1.7 points from August, while the Northeast placed last, at 43.7, a drop of 3.1 points from last month. By sector, commercial/industrial (50.9) was the only category with positive growth. 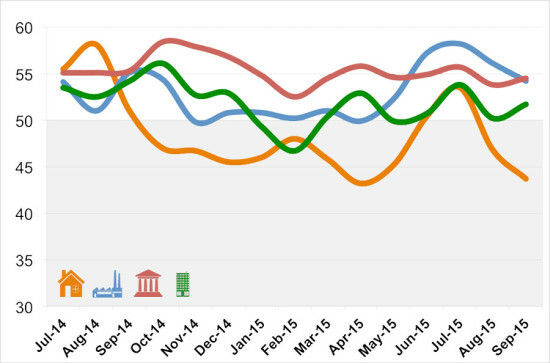 Multi-family residential flatlined at 49.5, while institutional dropped 2.2 points to 51.5. Mixed practice dropped 0.2 points to 52.6. It’s important to note that the regional and sector indices are calculated as a 3-month moving average, while the design contracts, inquiries, and national index are monthly figures. BILLINGS BY SECTOR: RESIDENTIAL (ORANGE), COMMERCIAL/INDUSTRIAL (BLUE), INSTITUTIONAL (RED), MIXED-USE (GREEN).